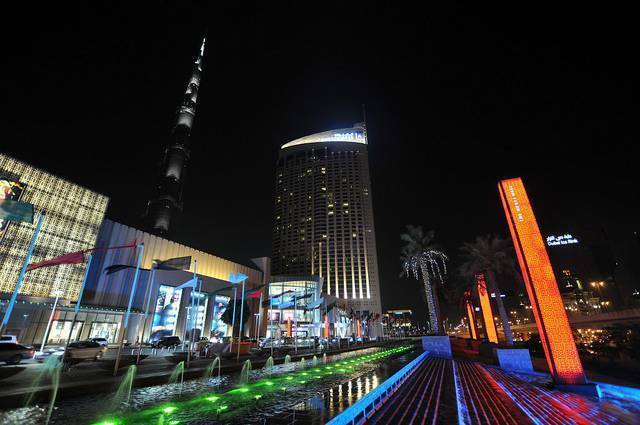 The Dubai Mall is a global village, housing the best entertainment, dining and shopping facilities from around the world. With an astounding 1200 shops and services, the mall is a huge entity that requires a whole day’s worth of exploring and walking. A shopaholic’s fantasy, the mall contains almost all major fashion brands in the world, from designer to mid-fashion retails. KidZania, an edutainment centre for children cannot be missed. The center stretches across a large, safe area and allows children to experience various occupations, from firefighting to jewelry designing. The mall’s ice rink is also a major attraction. Just skating around the rink and relishing the cold is a wonderful experience. After all these activities, visitors can sit back and enjoy a movie at the cinema or satisfy their hungry tummies at one of the many local and international restaurants, that serve an array of cuisines. The Dubai Fountain is the epitome of grandness and splendor. Performed to international and traditional music, the fountain show is a treat to the eye, and occurs daily at regular intervals. One must definitely set out an entire day to fully make the most of this brilliant and alluring mall.